What could be better than a stack of cash, I hear you ask; or a massive winning? Click here to play! Tunzamunni, that's what! This traditional 3-reel slot is played across a single pay line and is giving away some incredible cash jackpots to winners. There are 5 coin slots available for play, and if you wager all five coins you will be guaranteed a chance to win the Jackpot! This progressive can only be played with real money, so no fun money is allowed. However, you'll be more than happy with the result when you spin up red, white, and blue 7s from left to right. There is well over $100,000 to be won, and who knows, it could be you! 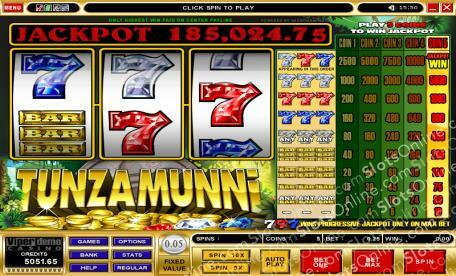 Tunzamunni can be played for the truly incredible cash jackpot today.